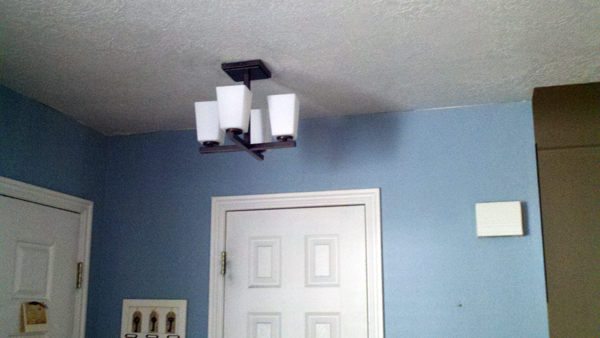 I recently upgraded my entry/living room light! I would like to say that my wife and I can finally see in our living room because we actually have enough light in the room. The reason why we didn't ever have enough light in the room is because in my townhouse the light for our entry/living room is in the very corner next to to the entrance which drastically reduces any amount of light that you try to use for a normal living room space. 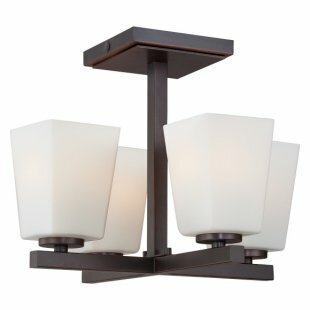 So my wife and I saw this Minka semi-flush mounted light which can take up to 4 - 100 watt light bulbs (standard flushmounts max out at 3 - 60 watt bulbs) we love the design because it adds more depth, has more of a designer feel and gives off the look of a miniature chandelier for my entry without hanging down into the door. Manufacturer has 320 items available. This Four Light Semi-Flush Mount has a Bronze Finish and is part of the City Square Collection.